Usually, on Thursdays we have giveaways around here. Welp, this week I'm taking a break and hosting a giveaway on instagram with some of my favorite things ((this sephora lip tar, a $25 gift card to starbucks, a red headband from my holiday collection and a handmade flannel scarf that is my own cozy design. Are you on instagram? 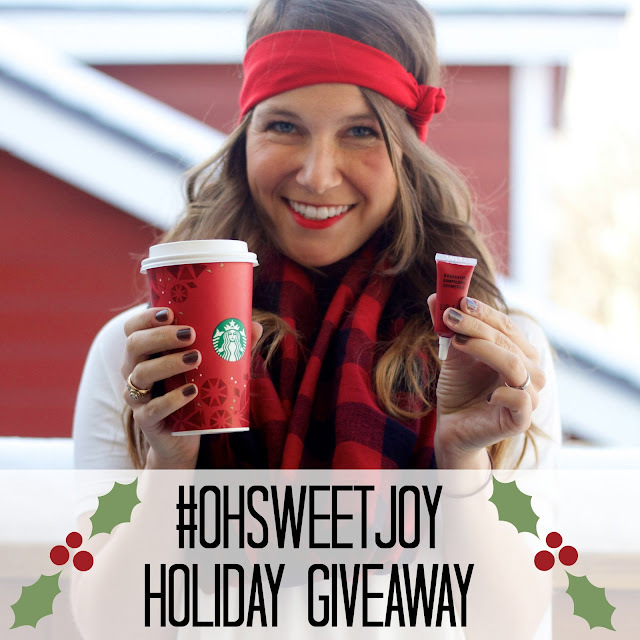 Follow me and repost this photo with the hashtag #OHSWEETJOY for a chance to enter! Kim, I recently ran into your blog on Instagram and LOVE it!!! I am not a big headband person but seeing all of your adorable pics makes me want to wear headbands. Do you have a red one similar to what you have on in the give away pic? If so, how much? They are in my shop ohsweetjoy.bigcartel.com under the holiday collection - "santa's hat"